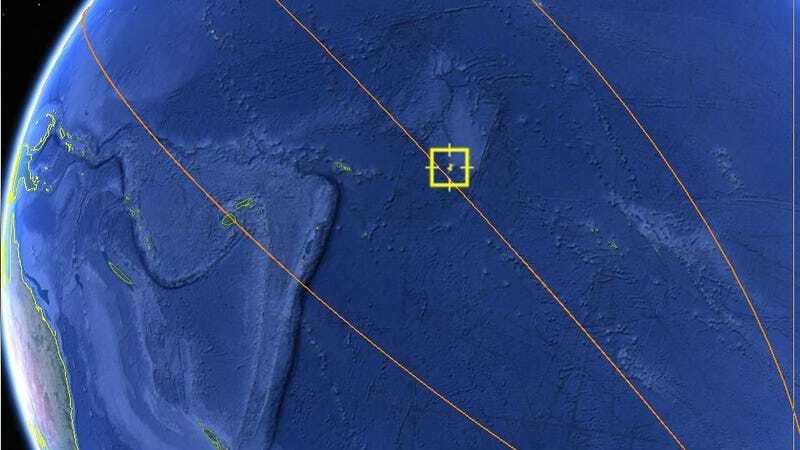 The satellite’s reentry location over the South Pacific. If you closed your eyes and threw a dart at a spinning globe, odds are you’ll strike the Pacific Ocean. And that’s just where the doomed Chinese satellite Tiangong-1 landed last night. The space station reentered Earth’s atmosphere over the Pacific Ocean, northwest of Tahiti, at 8:16 p.m. ET Sunday, the U.S. Strategic Command’s (USSTRATCOM) Joint Force Space Component Command confirmed in a press release. This draws the satellite’s long saga to a close, and highlights just how difficult it is to track where on Earth falling space debris might land. Many space fans and astronomers spent much of yesterday tracking the spacecraft through the USSTRATCOM’s space-track.org, wondering where it might land. It ended up pretty much exactly where many expected it to end up: the middle of the ocean. China launched the school bus-size satellite in 2011, but in 2016 informed the United Nations that it wasn’t functioning. A European Space Agency-led consortium took to tracking the satellite, but was unable to offer a firm prediction of where and when it would crash back to Earth until just days before. Chinese disputes that the re-entry was “uncontrolled,” the language used by the rest of the world, reports Space.com. As predicted, the spacecraft hit an uninhabited region of Earth, though the fire ball possibly could have been visible to some people in Korea or Japan prior to reentry. This was a lot of hype for a relatively small object. Some previous uncontrolled reentries have involved much larger spacecraft, such as the 152,000-pound Skylab, parts of which hit Australia n 1979. The Mir space station was also larger, but its reentry was controlled and it hit the Pacific Ocean. Despite the loss of Tiangong-1, China’s space program continues apace—Tiangong-2 is still orbiting the Earth, and the country hopes to establish a permanent space station by 2022. We’re glad this is fuss finally over—now perhaps we can focus on things that, you know, will actually hurt people.